Condoleezza Rice, formally sworn in as U.S. secretary of state on Wednesday, went through it again Friday for ceremony's sake in the State Department's majestic Benjamin Franklin dining room. 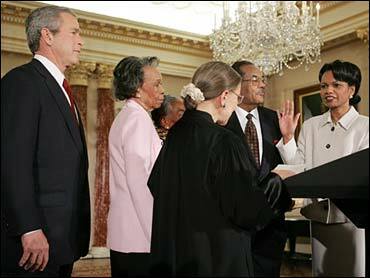 Supreme Court Justice Ruth Bader Ginsburg administered the oath to Rice, the 66th secretary of state, with President George W. Bush looking on. Bush elevated Rice to the role of top U.S. diplomat after she served for four years as his national security adviser, and her private, official swearing-in occurred Wednesday night at the White House. Rice hit the ground running Thursday with a pep talk to cheering State Department employees crowded into a lobby, meetings on Iraq and the tsunami disaster and telephone conversations with seven foreign leaders as she planned a trip to Europe and the Middle East next week. "It's great to be here," she said upon entering the building where she was an intern in 1977 in the bureau of education and cultural affairs. "There is a lesson in that," Rice joked. "Be good to your interns." Her trip next week to Europe, foreshadowing one later in February by the president, was widely expected, but not her foray to the Middle East. It promptly carries out a promise she made to the Senate Foreign Relations Committee during her confirmation hearings that she would become personally involved in efforts to resolve the Arab-Israeli conflict. It will be a brief visit, tucked in-between European stops and confined to meetings with Israeli and Palestinian leaders. There are no planned diversions to Egypt, Jordan, Saudi Arabia or Iraq. The aim is to measure the likelihood of generating momentum to drive Israel and the Palestinians to the peace table. In making preparations, Rice met Wednesday at the White House with Israeli Foreign Minister Silvan Shalom and talked on the telephone Thursday with Palestinian leader Mahmoud Abbas. Next week, she is to meet in Washington with Dov Weisglass, who is Israeli Prime Minister Ariel Sharon's chief of staff. David Satterfield, a senior State Department Middle East expert, said Thursday the prospects for movement in the Arab-Israeli conflict were better than at any time in the past four years. Addressing a conference sponsored by the U.S. Institute of Peace, Satterfield said the Gaza withdrawal Israel has proposed offers a "tremendous opportunity" for progress toward a peaceful settlement. He cautioned, however, that a Palestinian state "can't be built on the foundation of terrorist violence." Satterfield said there has been some progress in U.S. consultations with Israel on the routing of the separation barrier that Israel is constructing in the West Bank to enhance its security. It is intended to screen out Palestinian bombers. In a keynote speech to the same conference, former Assistant Secretary of State Martin Indyk said it was "absolutely essential" that Bush and Rice get personally involved in Mideast diplomacy. "The first requirement is sustained presidential engagement," said Indyk, who heads the Saban Center at the Brookings Institution. But if the United States became "bogged down" in Iraq it would make peacemaking between Israel and the Palestinians more difficult, he said. Rice's Mideast visit was prompted by a series of promising developments after the death of Palestinian leader Yasser Arafat last November.